Kids and kayaks are a seriously good mix. Super safe, perfect for mastering the basics and getting confident in the water, kayaking is one of the best ways to get a first taste of fun on the water and learn new skills. Kayaking is an awesome fully inclusive, perfect-for-everyone activity. Kids absolutely love it and seeing their massive smiles as they paddle across the ocean dipping in and out of caves and past usually inaccessible parts of the coastline is our ultimate goal. 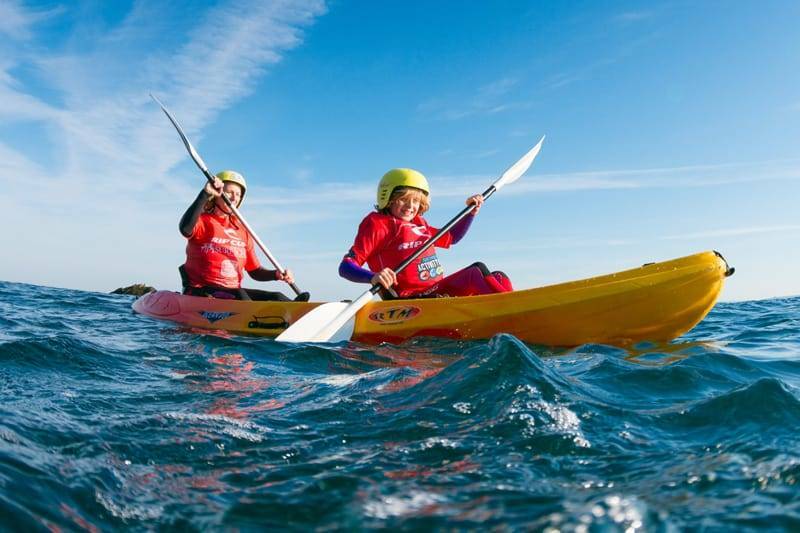 We’ve designed our kids kayaking safari to max out on the spectacular parts of Newquay’s amazing coastline along the Gazzle, a 2km stretch teaming with marine wildlife, unique rock formations and iconic features. And if young adventurers aren’t blown away by the incredible sights they certainly will be when we share tales of Newquay’s dramatic past and bring the coastline alive with smugglers, shipwrecks and brave fisherman. There’s also wildlife encounters and games aplenty to hike up the wow factor and make this an experience they’ll never forget. Safety is our number one priority. Everything that we do comes back to making sure kids enjoy the ocean in the safest way possible and with 20 years experience we’re experts in helping kids push their limits in a supportive environment. They’ll have a great time – guaranteed – but they’ll also learn important water safety skills, build confidence and develop a whole new respect for the environment. Not bad for kayaking lesson hey?! At our Towan Beach HQ we’ve got equipment especially for children so they’ll get fitted with wetsuits and buoyancy aids and before we even hit the water there will be safety briefings, demos, practices and warm up activities. Phew, it’s a jam packed session! So drop us a line or give our team a call and we’ll sort you out with the best activity for you! Call 01637 877722, lines open from 8am-10pm.